The sign out the front of The Gallery Cafe says that their Devonshire Teas are famous. Who decides this, I don’t know, but I’m scratching my head trying to work out why, as I’ve just come from two other places that you could definitely say that. The Gallery Cafe is your typical tourist café on a very touristy strip in Eagle Heights. When I arrive it’s empty. It’s not quite 2pm and already the ‘closed’ sign is about to go up, which doesn’t really give you much time to try the famous Devonshire Tea. The inside of the café is cavernous and bright, and would be toasty warm on a cold winter’s day. At one end there is an area posing as a gift shop selling goods geared to the tourist trade. I settle in the large leafy courtyard out the front, happy for some autumn sunshine and mountain air. There’s something about my scones being served on a metal tray that irks me. It feels clinical, soulless even. 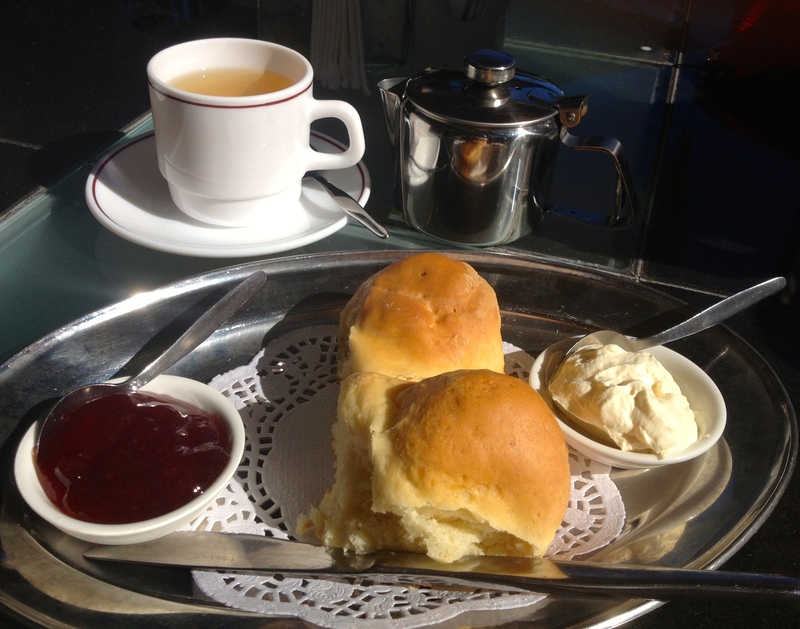 The scones are light and soft, nice enough but are a bit like sweet bread rolls. The strawberry jam is sickly sweet (low quality?) but I love the thickly whipped fresh cream that basically makes this Devonshire Tea good enough – but – definitely not famous. Closed on Thursdays. Tea: A range of tea bags. My green tea is an ALDI Diplomat tea bag served in a small teapot. Overall: A pleasant café geared to the tourist trade.